In the bowl of a food processor, ladle two cups of cooked beans along with liquid they were cooked in. Add ¼ cup extra virgin olive oil and process until smooth or desired consistency is reached. 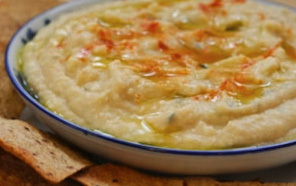 Serve at room temperature drizzled with two tablespoons of reserved early harvest, fresh pressed extra virgin olive oil. The spread can be served with crudités, crackers, pita, or crusty bread.